Time for another annual meteor shower! August brought the Perseids, last month we had the Leonids and this time, we’ll be treated to the Geminids, which occur every year during December. This shower is named after the constellation Gemini, from which the meteors appear to fly on their path across the sky. Although the meteor shower happens at a time when it’s pretty chilly for many people to be outside, those who can score a clear night and don’t mind the cold are in for a spectacular show. 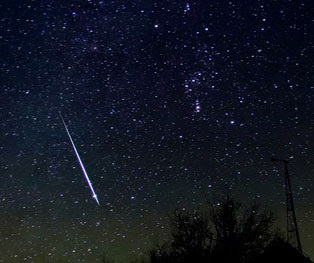 The peak of the meteor shower will happen in the wee hours of December 15th; however, we’ve heard from guests that the shooting stars were out in full force as early as this past Tuesday night. We’re heading outdoors tonight to see what we can see in the beautiful night sky above the Inn. This entry was posted in Uncategorized and tagged stargazing by Inn on Mill Creek. Bookmark the permalink.